I’ve been gluten-free since last summer. I went dairy-free the first of this year. I recently started getting back into the routine of exercising four to five times a week, and I’m making every effort to read and crochet each day. In addition to my daily quiet time, I’ve started taking a “time out” several times a day to read some Psalms and pray. In the past few weeks, I’ve drastically reduced my sugar consumption. Yes, my life looks much different from many people’s. Some of these decisions I made for my physical health. Some of these decisions I made for my mental, emotional, and spiritual health. Following the culture hasn’t worked for me. I needed a change. The thing about change is that it’s uncomfortable. It’s hard to learn a new way of eating, to rearrange your schedule to accommodate exercise, to stop throughout the day to pause and remember that God is in your day with you and you’re not alone. It makes me uncomfortable to have to ask for the manager every time I enter a restaurant (in addition to being dairy- and gluten-free, I also have a life-threatening allergy to another food) and to demand (nicely, of course) that they take appropriate steps to keep me safe. I don’t particularly appreciate the discomfort involved in exercise and the soreness that accompanies working out. I do, however, like the results of all of these changes. That’s why I continue to press forward with my plans. The longer I do these things, the more they become habits, part of the dailiness of my life, the more I embrace them because they’re good for me and because I feel better when I do them. They become my “new normal.” After a while, they don’t feel new anymore. They just feel normal. Explaining why I do what I do seems less embarrassing and more matter of course. It’s just what I do. If you’re trying to make big changes in your life, start with one thing at a time. Don’t try to make all of them at once. When one change begins to feel normal, start another one. There’s no way to tell exactly how long it will take for you to feel “normal” about the changes you’re making. It depends on your personality and the magnitude of the change you’re making. Give yourself grace. 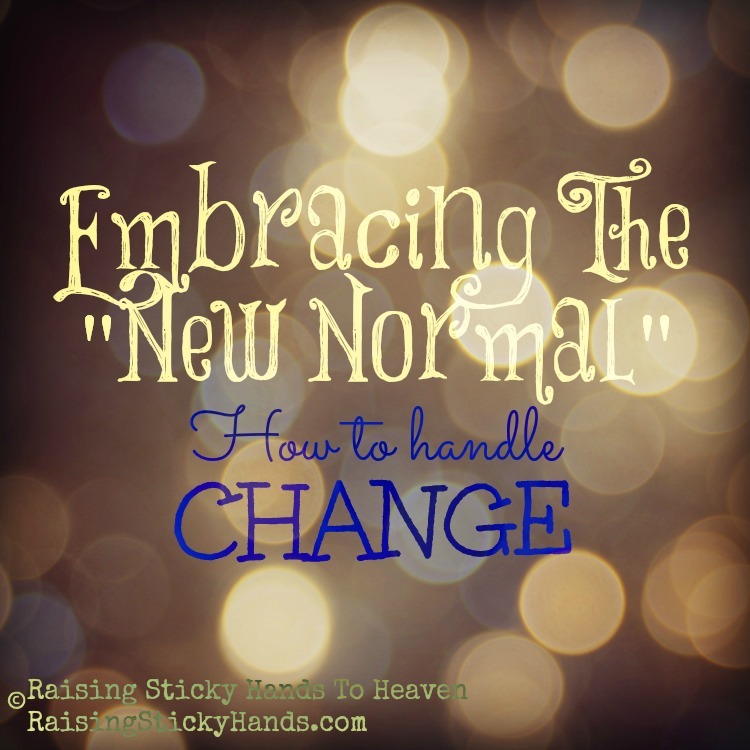 Embrace the change, knowing that it will eventually feel normal. I’m the queen of keeping things comfortable and familiar. Change is difficult and scary for me. If I can do this, you can too. As a wise friend told me last week, “Just do the next right thing.” That’s how you change your life. What is your best tip for making a big change?